YouTube user "Donnie Does" recently threw on a pair of sunglasses, a headband and a tennis outfit and walked around the streets of Shanghai pretending to be Roger Federer. While the resemblance between the two wasn’t even that strong, the people of Shanghai couldn’t contain their excitment and fell for the trick in a big way. They were overwhelmed by being in the presence of a sports legend. "Roger" was mobbed. "Roger" kissed babies." "Roger" signed autographs. 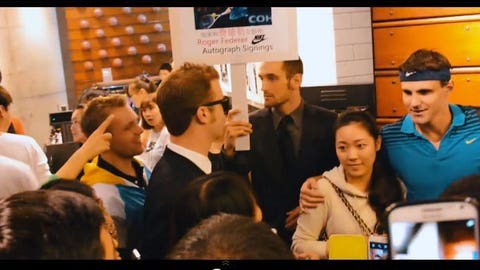 "Roger" made an appearance at a Nike store. Watch the scam unfold below.